Have you ever thought about how hard your bus driver works? They might make the job look like it’s just tootling around all day, but bus drivers have to work hard, be constantly alert, and perform their duties with a smile. According to research done in the EU, buses are the safest way to travel. They are even safer than walking! This is in large part due to the excellent training that bus drivers receive. They have to pass difficult knowledge and driving tests, take medical exams, and continue to take classes throughout their careers to improve their driving. Most people have had the experience of driving the family car with the distractions of passengers talking or kids crying. Now imagine doing it with 30 passengers while handling a 40 foot, 27,000 pound vehicle! Bus drivers must be intensely focused at all times to keep you safe on the road. Some people might choose to take the bus in the winter when the weather is bad so they don’t have to drive. But the bus drivers are still driving in that nasty weather! Bus drivers work in rain, sleet, hail, snow, and high winds, at all times of day and night. Not only do they have to make sure their own driving is safe, slow, and careful, they have to watch out for other drivers who are going too fast for the conditions. People slide on the ice or pull right out in front of buses, and those buses don’t stop on a dime! Bus drivers have to be extremely skilled to stay safe in winter weather conditions. Bus drivers do an excellent job of running their routes on time. Think about how difficult it is to time a trip. You’ve been to the same grocery store or friend’s house or you kid’s school dozens, maybe hundreds of times, but do you know exactly, down to the minute, how long it takes to get there? Most of us estimate, “Oh, it takes about 10 minutes,” then when we hit a little traffic, we’re 5 minutes late! Bus drivers stay on track the majority of the time. It’s frustrating when they are late, but consider the reasons. They may have had to help someone in a wheelchair get on or off the bus at the last stop. Maybe there was a car accident and they were held up in traffic. Maybe an elderly passenger took a long time fishing change out of her purse. Try to be patient with your bus driver when he or she is late, and consider all the times they have been on time despite constant fluctuations in the contributing factors. Sometimes passengers get angry at bus drivers for not having change, for fare increases or for being 30 seconds late. Sometimes passengers are intoxicated and acting rowdy. 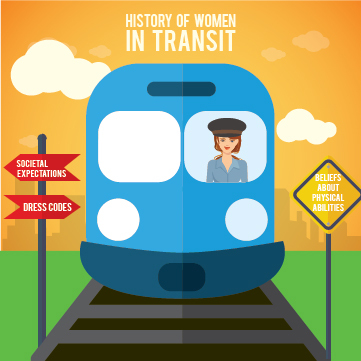 Some passengers harass other passengers, threaten other passengers or the driver, or bring weapons on the bus. Bus drivers deal with all of this in a professional and firm, yet kind manner. They have to make judgement calls about allowing potentially troublesome passengers on the bus and how to handle rule violations like standing in the front of the bus, and they have to do it in such a way that does not escalate a possibly dangerous situation. Even on less eventful days, bus drivers have to deal with hundreds of people in a polite and professional manner. They say “hello” and “good morning” and “have a nice day” dozens of times. They patiently help an elderly passenger up the steps, give a lollypop to an upset child, and listen to that one passenger’s story about his cats for the 300th time. 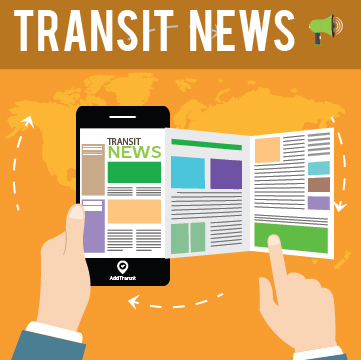 They remember the names and the faces and the usual stops of their regular passengers, and they help new passengers figure out the transit map. And they do it all with a smile! On this Transit Driver Appreciation Day, AddTransit wants to say THANK YOU to all the bus drivers around the world for doing their job well, keeping their passengers safe, and providing excellent customer service! 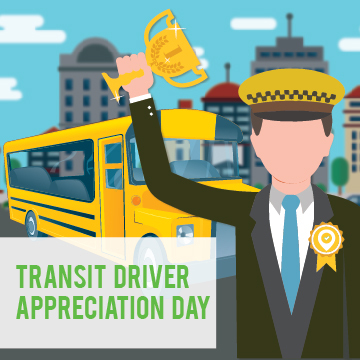 If you’d like a special way to say thank you to your bus driver, check out the Transit Driver Appreciation Day website. They have thank you cards you can print. You can also use the #tdad hashtag on social media and tag your bus or public transit company. 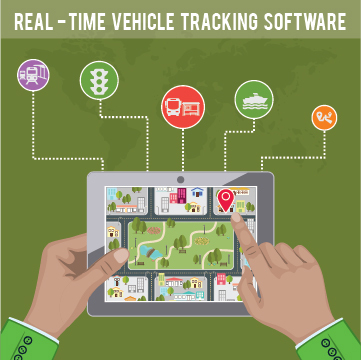 Online real-time vehicle tracking software gives you the ability to view your bus positions, locate your trains and monitor your ferries or trams wherever they are. Additionally, you can provide this same information to passengers so that they can plan their journeys and so that their friends and families can have the security of knowing when they will depart and arrive. AddTransit’s technology is easy to deploy. There is no need for IT consultants or hardware that costs tens of thousands of dollars. Instead we just add an app to a GPS enabled smartphone or tablet which is carried on the vehicle. With the accuracy of smartphones now being approximately the size of a vehicle in an area with good mobile/cell coverage, this enables the vehicle location to easily be pinpointed. The smartphone or tablet, then sends a secure signal using the HTTPS protocol to our servers, which then display the location on a map. To ensure secure and accurate vehicle tracking, each vehicle is has its a unique identifier (e.g. a Licence Plate or Registration Number) entered and the on board company representative (e.g. driver, pilot, or other staff member) has to login. Key trip details are also selected so that you can know which vehicle, company representative is currently logging the vehicles location. Tracking bus positions, or other vehicles locations is then as simple as logging into the AddTransit website. The location of the bus, ferry, train or tram are shown on map and update at regular intervals. Depending on your need, you can select to monitor a particular vehicle, trip or route. As the solution is online and real-time, you can monitor your vehicles from wherever your staff need to. For example, your staff could monitor your vehicles from both the head office and from ticket sales locations, depots or docks. Using AddTransit’s online real-time vehicle tracking also enables you to have your vehicle’s locations displayed on vehicle tracking apps, journey planners and maps. We can provide a GTFS Real-time data feed which can be used by companies such as Google, Microsoft and Yahoo to display your vehicle’s locations on their maps. Contact us to find out more or Sign up today!